In a newly published study, researchers from Yale University detail a key molecular fitness signal that prevents vessels from becoming narrow and developing dangerous plaques. Blood vessels need constant maintenance if they are to remain healthy. Yale researchers describe a key molecular fitness signal that prevents vessels from becoming narrow and developing dangerous plaques. The research appears in the September 23 issue of the journal Science Signaling. Researchers found that blood vessels in mice lacking signal fibroblast growth factor receptor 1 became narrower and accumulated deleterious smooth muscle cells, seen in red in the accompanying photos. “We found FGFR1 to be crucial to maintaining normalcy,” said Yale’s Michael Simons, senior author of the study. The knowledge should help design better therapy to maintain vascular health and to prevent vessel narrowing that occurs in many life-threatening illnesses. Abnormal vascular homeostasis can lead to increased proliferation of smooth muscle cells and deposition of extracellular matrix, resulting in neointima formation, which contributes to vascular lumen narrowing, a pathology that underlies diseases including transplant vasculopathy, the recurrence of stenosis, and atherosclerosis. Growth of neointima is in part due to endothelial-to-mesenchymal transition (EndMT), a transforming growth factor–β (TGFβ)–driven process, which leads to increased numbers of smooth muscle cells and fibroblasts and deposition of extracellular matrix. We reported that endothelial cell–specific knockout of fibroblast growth factor receptor 1 (FGFR1) led to activation of TGFβ signaling and development of EndMT in vitro and in vivo. Furthermore, EndMT in human diseased vasculature correlated with decreased abundance of FGFR1. These findings identify FGFR1 as the key regulator of TGFβ signaling and EndMT development. 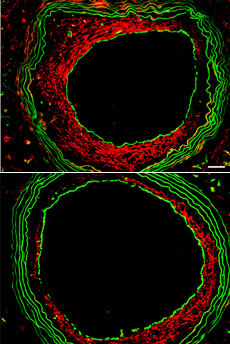 Be the first to comment on "Yale Researchers Detail How Blood Vessels Stay Fit"